Greece is the cradle of Western civilization. Greek culture was so influential that it became the foundation of Western society. Plato and Aristotle taught us about philosophy and logic. Euclid established principles of geometry that are still used today. Archimedes was a great inventor and mathematician. The Greeks had sophisticated literature, poetry and drama. The Iliad and the Odyssey are the masterworks of Homer. The famous drama Oedipus the King (Oedipus Rex) was written by Sophocles. Ancient Greek religion has survived to this day as Greek mythology, and the Parthenon in Athens, which was a temple for the Greek goddess Athena, is evidence of the greatness of Greek architecture. The Greeks influenced Roman culture in religion, art, architecture, literature and philosophy, and the Romans disseminated the knowledge obtained from the Greeks throughout all the lands that they conquered, which included most of Europe. Greece has approximately 6,000 islands in the Aegean and Ionian Seas, but only 227 are inhabited. 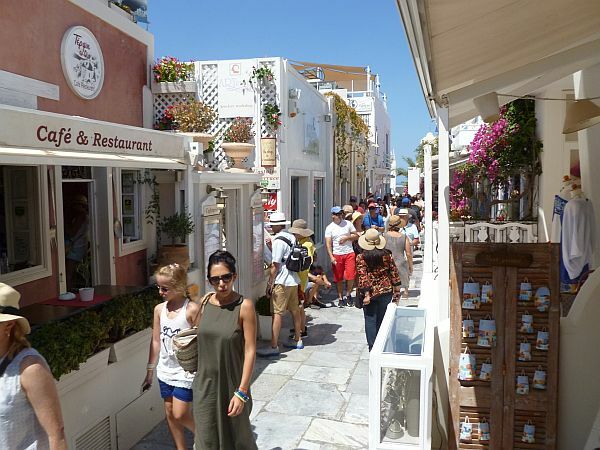 Santorini, which was known as Thera in ancient times, has an area of approximately 73 square kilometers (28 sq. mi.) and a population of 15,550. Santorini is a popular destination for cruise ships because of its impressive views of white buildings against a background of dusty volcanic rock. Winding road from the port to the city. 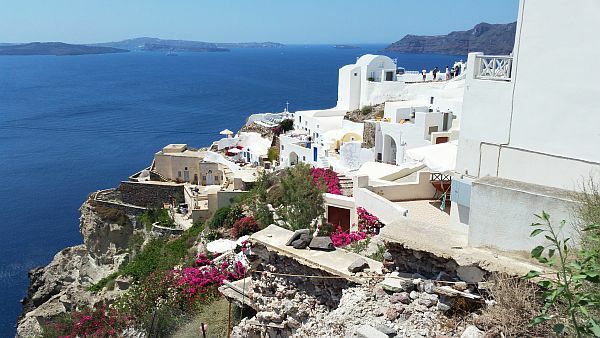 Santorini is perched upon the rim of a volcano that erupted approximately in 1627 BCE. 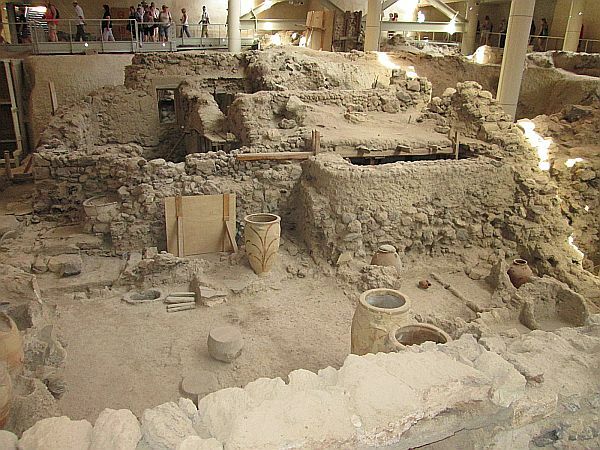 The eruption destroyed a Minoan settlement near the modern city of Santorini. 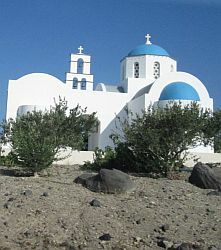 Ormos Athinios is the primary seaport of Santorini. As the ships approach the port, the city above appears as white frosting on top of a grayish-brown layer cake. The layers of volcanic deposits are traversed by a steep road that zigzags from the port to the city. This road is used mostly by tourists riding donkeys or by cruise passengers who like the challenge of a brisk hike while avoiding the donkey manure. Cruise ships dock in the deep water of what was once the caldera of the volcano. Small boats transport passengers to and from the cruise ships. The city can get very crowded when several ships arrive at the same time because each ship can carry several thousand passengers. The rim of the volcano is not level. Houses are built on terraces carved out of the pumice rock. Most buildings have a good view of the sea due to the inclination of the terrain. 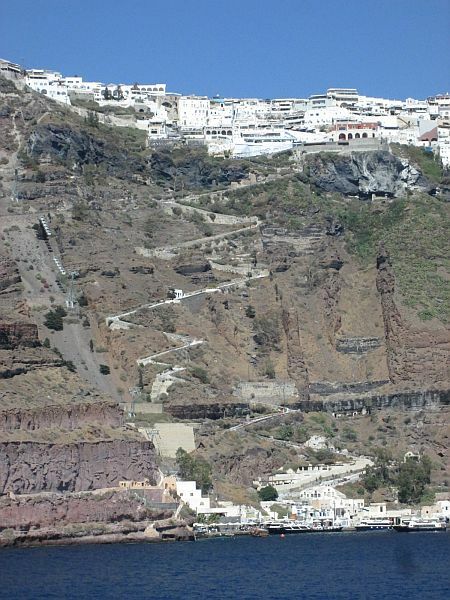 Land is very expensive in Santorini and the houses are built close to each other. The streets are very narrow and not designed for cars. Tourists walk from the bus unloading areas to the shops in the city. I visited Santorini on a hot summer day. 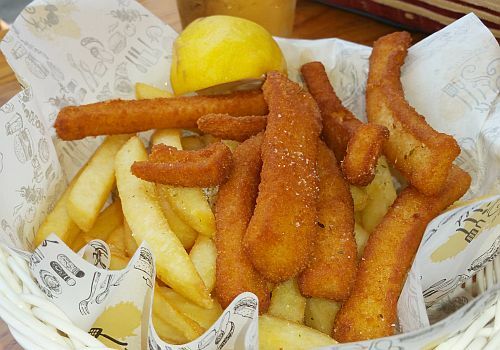 I stopped at a small corner restaurant that offered sandwiches and "calamari". You can judge from the picture that the "calamari" does not look like the typical serving of squid, but the cold beer was refreshing. 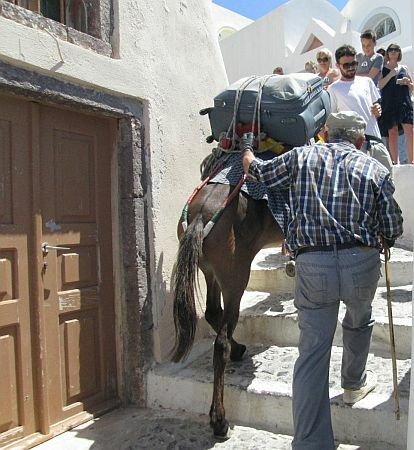 Travel light if you are planning to stay in a hotel in Santorini. The streets are uneven and hilly. Some streets have stairways. Fortunately, you can hire donkey services to carry your luggage. 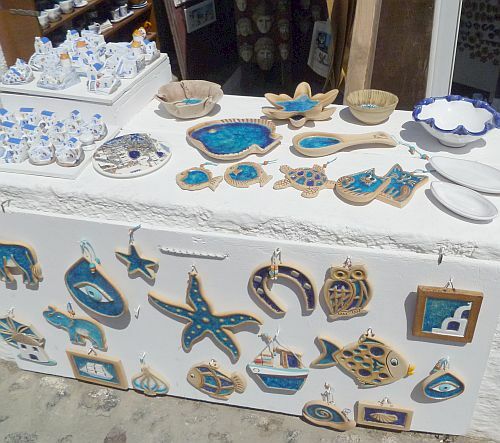 Like most tourist destinations, Santorini has the typical T-shirts and bags stamped with various designs. You can also find ceramic spoon rests, hanging decorations, and miniature landscapes with the typical white buildings with blue roofs. When you walk along the narrow streets or stop at a cafe with a nice patio, you may find particularly picturesque panoramas. 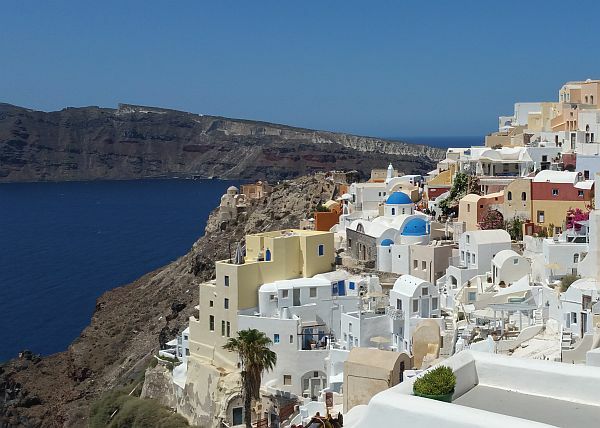 The beauty of the tightly packed white houses against a background of brown volcanic rock and the blue sea and sky provides justification for the trip to Santorini. Thera is the ancient name of the Greek island of Santorini and the name of the volcano that erupted in the middle of the Bronze Age. Akrotiri was a Minoan Bronze Age settlement that was destroyed and buried in volcanic ash by the eruption of the volcano about 1627 BC. The pumice and volcanic ash preserved the Bronze Age town. Archeological excavation of the ruins is providing many clues about the way of life of the people who lived here. Akrotiri was a small fishing and farming community established along the coast. The presence of rock-cut burial chambers, wall paintings, pottery, stone vases and figurines suggest a period of significant growth and trade. The digs have not discovered any skeletons of people who died during the volcanic eruption like in Pompeii. Archeologists speculate that there may have been warning tremors and that people fled the island in boats. Fragile vases have been found under tables that protected them from falling debris. The residents were clearly planning to return after the volcano settled down, but this was made impossible by the large quantity of volcanic ash that covered the town. The Minoan eruption of Thera devastated the island of Thera (now called Santorini), including the Minoan settlement at Akrotiri. The settlement, which had been near the sea, was raised many meters above sea level by geologic forces, making it unusable as a fishing port. The volcanic eruption also affected the communities and agricultural areas of Crete which is only 120 kilometers (75 mi.) south of Santorini. Evidence of a tsunami has been found on the northern side of Crete facing Santorini. 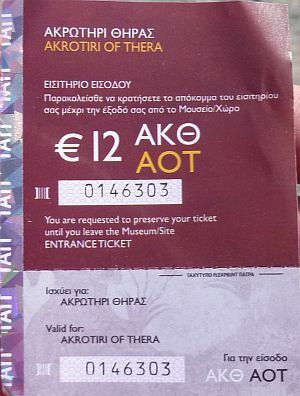 This was a great blow to the seafaring Minoan culture on Crete, and it ended its dominance of the Mediterranean Sea.